Anyhow, I absolutely LOVE using sugar scrubs in the shower because it leaves my skin so baby soft and plenty moisturized. AND here’s the bonus- I can skip applying lotion afterwards (love efficiency)! 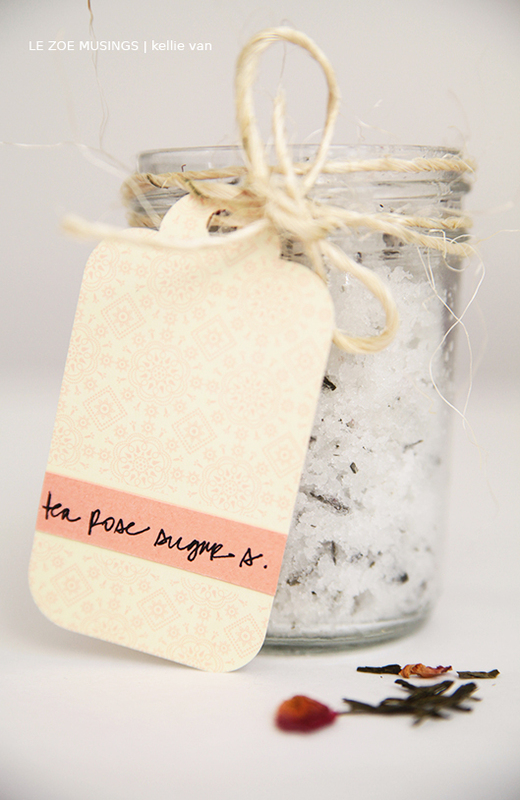 Sugar scrubs are definitely my go to beauty regimen for winter scaly dry skin. A few weeks ago, I used up the last tid bit of my sugar scrub. Haven’t had the chance to buy another one when it hit me… why can’t I just make my own?!! Did some quick research online and found that it was such an easy and inexpensive thing to do. All you really need are oil and sugar. The rest are minor details. My first sugar scrub ever! It smells AH-MAZING!! The first part is choosing an oil. There are several options for this including (but not limited to) almond oil, extra virgin olive oil, coconut oil, avocado oil, vitamin e oil, and baby oil. I chose coconut oil b/c I didn’t want the sugar to turn yellow which is what olive oil would do. Plus I like the smell of coconut. However, if I didn’t already bought the coconut oil, I would’ve used baby oil. 2nd part is choosing the sugar. This is fairly simple- either regular granulated sugar or brown sugar (softer for sensitive skin). The mixture is typically 2 parts sugar to 1 part oil. Because coconut oil is solid at room temperature, I melt it prior to mixing. 3rd part’s all about details: scent and aesthetics. Add essential oils of choice to achieve your favorite scent. No essential oils? Just add in raw ingredients such as lemon, dried lavender flowers, peppermint, rosemary, honey, ginger, or in my case…tea! I have the most amazing scented tea sitting on my shelf. 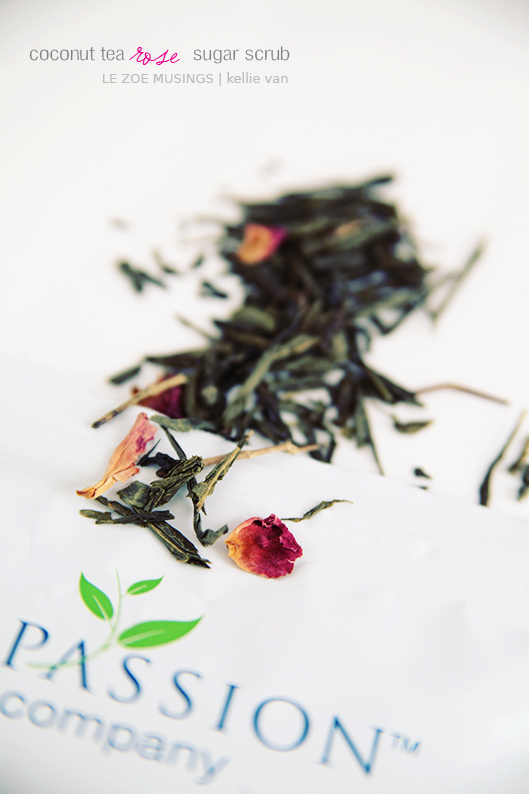 This cherry rose tea was sent to me from the folks over at Compassion tea a while back. It was so perfect for this project. 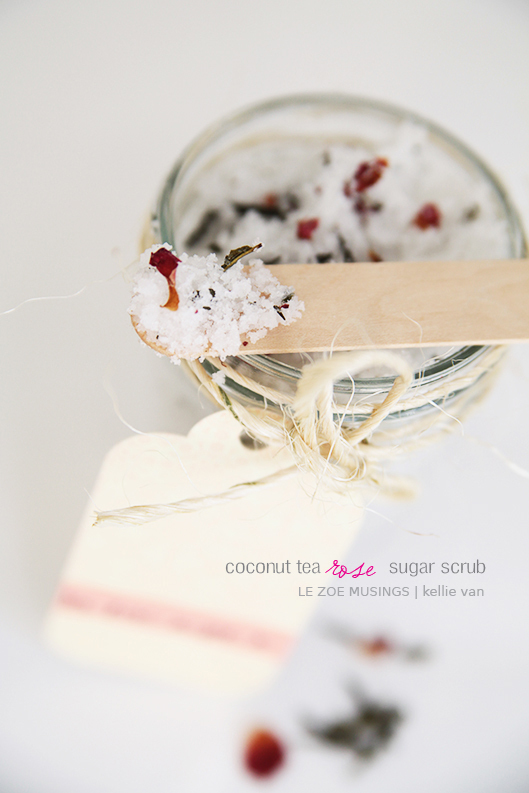 I crushed the tea leaves and mixed them into my sugar scrub for texture and visual. Not to mention, the smell of the roses is so delightful! LOVE tea and passionate about helping others? Compassion Tea donates 100%(!) of all profits to the efforts of CompassionNow to help the world’s less fortunate. To learn more about the company’s amazing mission, please click here. If only you can actually smell this in person… or through the computer screen! Add labels and send them off to your favorite loves. Can’t think of a better gift! 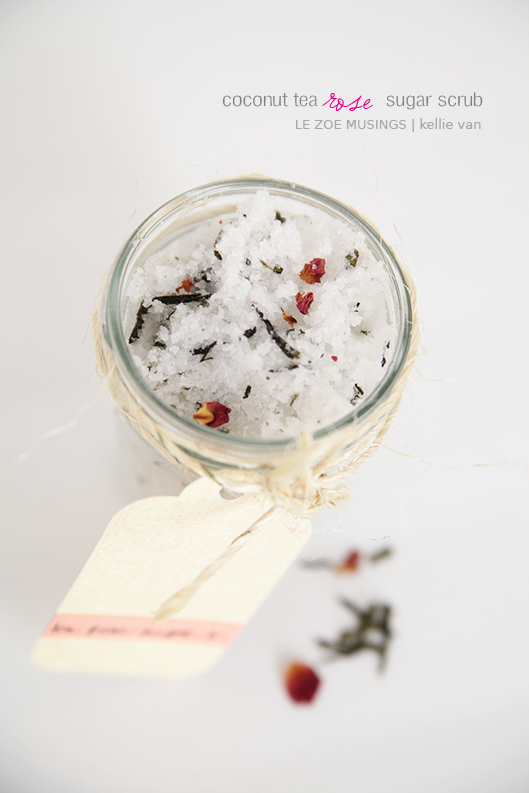 Next time you’re in dire need of a gentle exfoliator that’s cost effective, smells amazing, super moisturizing, and will leave your skin as soft as a baby’s bum… make your own body sugar scrub! So pretty! Might have missed it in the comments section, but how long does this keep? I’m walking to WHole Foods Right Now!!!! Thanks for the recipe! I can’t wait to get in the kitchen and find me some sugar. Beautiful and inspiring. Sugardiner. This looks wonderful! Thank you for sharing! I am looking forward to making this. Especially here in Hawaii. It shall smell like a local product! Mahalo for sharing. Love your blog too. Thank you for following mine. How did you make the labels? Hi Lisa- It was actually an old label that I found in my closet! I just cut a piece of rectangular stock paper and wrote the name on it then taped it to the label. I cheated! I definitely willgive it a try! It sounds promising – but it looks even more promising with the amazing photos you posted! Thanks a lot! This is an excellent, natural recipe, provided by fellow blogger, le zoe musings. It is sensitive enough for baby’s skin & has ingredients moms can trust. Plus, these items are probably on-hand and in your cupboards. I would definitely use a gentle sugar for baby’s batch and a more coarse sugar for myself. Enjoy! This is an excellent post. Why pay $5-10 for a scrub when I have all the ingredients for this on-hand? Wonderful! And I can use these gentle scrubs for my soon-arriving baby. Yay! This sounds great! Thanks for the suggestions. And thanks for checking out my blog! Thanks for liking Baby Death and for the follow. I didn’t even know you could a make a scrub this easily. Sent it to the wife! Thanks for connecting to my blog and bringing me to yours. I am definitely going to try this. And great shots. Thank you for the post. I too have the winter skin blues, and I happen to have all the ingredients on hand. Problem hopefully (dry fingers crossed) solved! Gorgeous! Love it! Thank you! Kellie, is it okay if I use this in our monthly newsletter? Of course, I will give you the credit and will add a link for your blog. Love this! Thanks so much for the shout out to Compassion Tea! 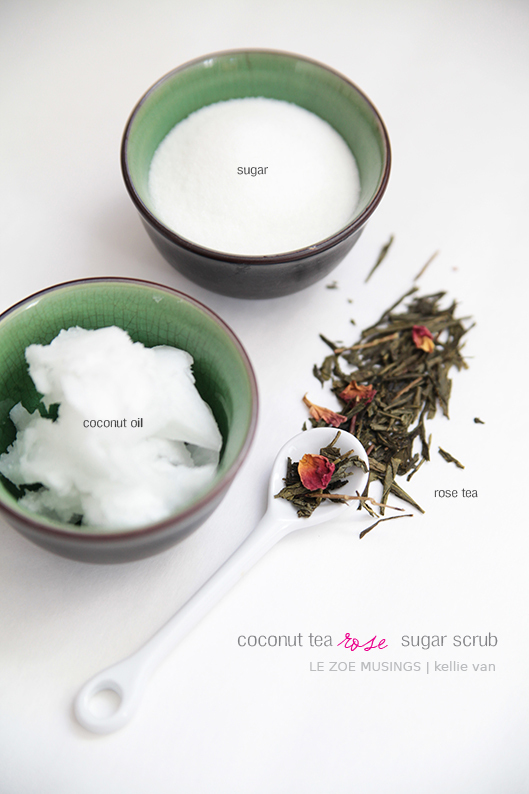 We love the idea of using the cherry rose for a scrub! Definitely going to reblog this for our followers! Thanks! This is such a great idea, thanks ! Laura- I’m very jealous, you are from FRANCE!! Thanks so much for posting this! Sounds fun & amazing. Cost effective too. Looks great and so easy!! Been experimenting with DYI beauty products and definitely need to try this!! Perfect. As moms it is all about being efficient with our beauty techniques now! Thanks for sharing! 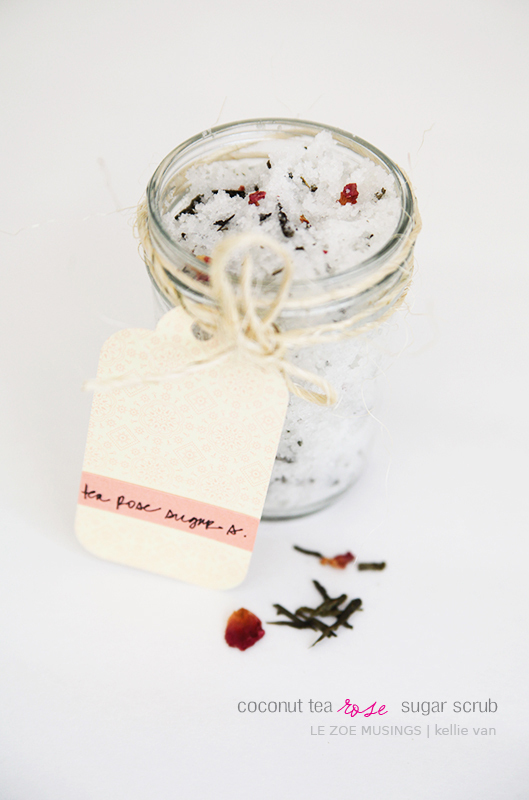 I love a good sugar scrub. Especially at this time of year! This is amazing idea! I definitely will try at home. We made a scrub similar to this before! It was great! Never thought to add tea to for fragrance..but definitely have to try! 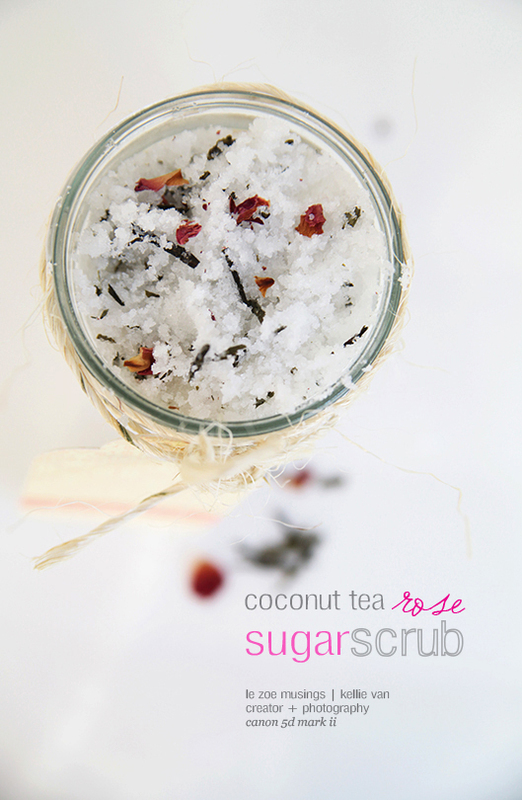 Mmm i love the smell of coconut and rose! I’m sure it smells amazing! This is amazing! Can’t wait to try it! 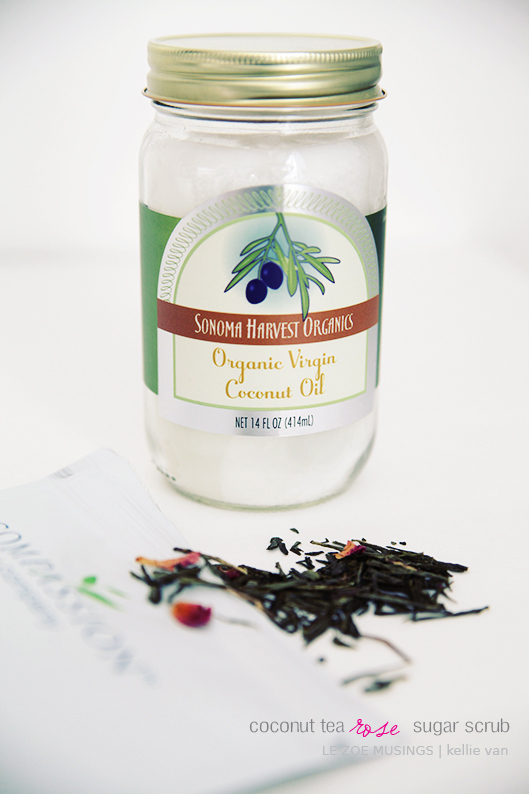 All natural ingredients… I am sold! Sounds wonderful for winter skin…just the smell of roses and coconut would be like transporting to a summer day or a tropical island. I’ve always wanted to try to make sugar scrub. Am inspired! There are the people who do and the people who watch; you’re a doer! I must try it this weekend for my dry hands. No matter how much cream and lotion I put – it doesn’t seem to work! Anyway this is really easy, I will certainly give his a shot. Love, love, love this Kellie! Thanks for some self-care inspiration. What a brilliant idea, I’m up or making one too. I bet you it smells lovely aslwell. This one is something I definitely want to try out! Thank you for sharing…and the photos are just lovely! A fabulous idea! This would be great for my hands this season, which seem to always age 20 years every winter as they are constantly dry and itchy. Thank you for sharing!